If you feel Apple’s new Mac mini line is lacking in color or pizazz, ColorWare has you covered with a range of custom color options for the new Mac mini. Aiming to help match your Mac to your office, home decor, or simply your sense of style, ColorWare has been adding its colorful flair to electronic devices since 2000, and has been altering Apple products for almost that long. 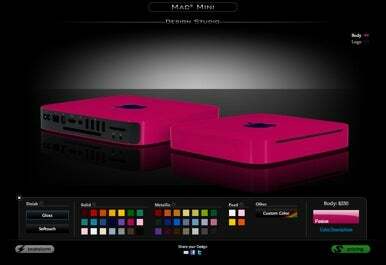 ColorWare’s Website features a virtual design studio that lets you choose your own custom color for your Mac Mini, as well as whether you’d like a glossy or matte finish. You can also select between Solid, Metallic, or Pearl color schemes. The Solid option provides a solid, plain color, while the Metallic option adds small metallic flakes that reflect light. The Pearl finish adds a pearl coating that gives a metallic look to lighter colors. You can send in your current Mac mini and have it colorized for $250, or you can buy a new colorized Mac mini straight from ColorWare for $1000 for the SuperDrive model or $1300 for the two-hard-drive server model.